Why should you order Mommy's First Milestone wine bottle labels? BONUS - 6 Different Mommy Milestones! Our wine bottle labels are the perfect addition to your baby shower, pregnancy announcement celebration & more! 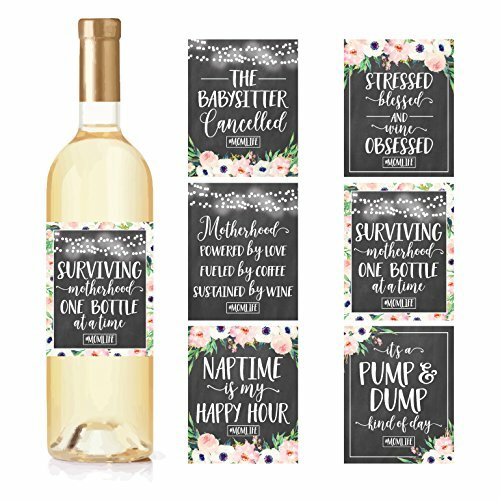 AMAZING BABY SHOWER GIFT: These Mommy Milestone Wine Labels are going to be a hit at the baby shower and everyone will ask you where you got them! The Mom to be will LOVE them! DELIGHT MOM-TO-BE AT BABY SHOWER: Leave the boring onesies to other guests and give the gift they'll laugh and remember for years to come! Every mom will be able to relate to each sticker! SHARE PRICELESS MEMORIES WITH FAMILY & FRIENDS: Use these wine bottle labels as decor at the baby shower! Everyone will love the funny sayings! It will be the top talking point of the whole shower!